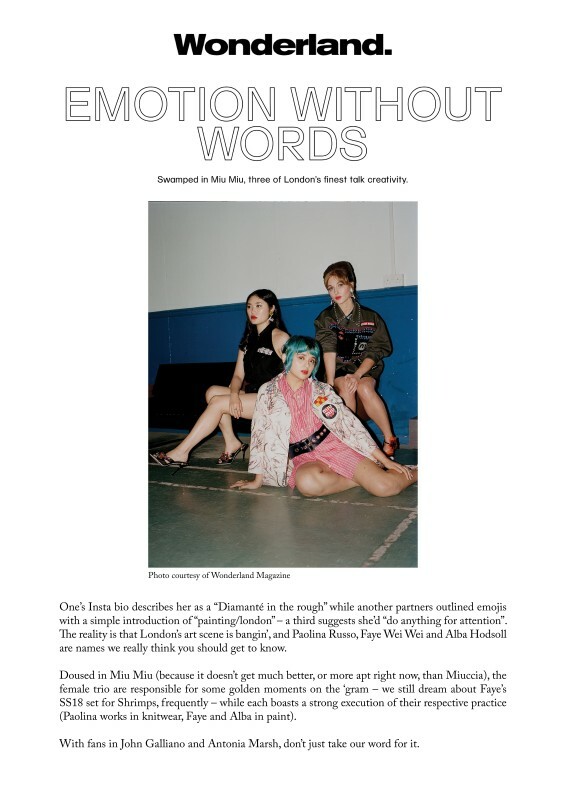 EMOTION WITHOUT WORDS - Swamped in Miu Miu, three of London’s finest talk creativity. One's Insta bio describes her as a "Diamanté in the rough" while another partners outlined emojis with a simple introduction of "painting/london" - a third suggests she'd "do anything for attention". The reality is that London's art scene is bangin', and Paolina Russo, Faye Wei Wei and Alba Hodsoll are names we really think you should get to know. Doused in Miu Miu (because it doesn't get much better, or more apt right now, than Miuccia), the female trio are responsible for some golden moments on the 'gram - we still dream about Faye's SS18 set for Shrimps, frequently - while each boasts a strong execution of their respective practice (Paolina works in knitwear, Faye and Alba in paint). With fans in John Galliano and Antonia Marsh, don't just take our word for it.